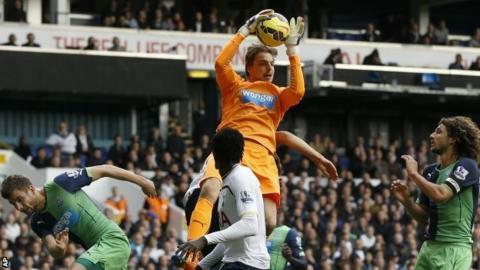 Newcastle manager Alan Pardew says goalkeeper Tim Krul could be sidelined for up to six weeks with his ankle injury. The Netherlands international suffered ligament damage during training before Saturday's 1-0 defeat by West Ham. It was originally thought he would miss five games, which would have been to 21 December, but the 26-year-old is now not expected to play again this year. Pardew said Krul would not return until "January - possibly mid-January". Former Charlton keeper Rob Elliott will continue to deputise for the Dutchman. Pardew said he was "worried" about defender Daryl Janmaat who came off with a hamstring injury in the West Ham game at Upton Park. Newcastle are already without forward Siem de Jong, midfielders Ryan Taylor, Rolando Aarons and Mehdi Abeid and defenders Fabricio Coloccini and Davide Santon. Midfield duo Moussa Sissoko and Jack Colback are now also absent through suspension. "It's critical in terms of the spine of the team: no Tim, no Coloccini, no Moussa, no Jack, who would all start if they were fit," Pardew said. "It's been blow after blow this year, but we've rode them and that's been the key to our success," added the manager, whose side are ninth in the Premier League table with 19 points from 13 games. "We've put younger players in and those in the group. We lose Tim but Rob's produced a super performance."